AIIMS, Jodhpur Recruitment 2018 2019 Application Form for 20 Non-Academics Junior Resident (Clinical) Posts Download Application through Official website www.aiimsjodhpur.edu.in. AIIMS, Jodhpur Non-Academics Junior Resident (Clinical) Jobs Notification 2018 Released. AIIMS, Jodhpur invites Walk in Interview for appointment in following Non-Academics Junior Resident (Clinical) post in All India Institute of Medical Sciences, Jodhpur. Candidates are requested to Download Application through Official website www.aiimsjodhpur.edu.in. Prospective candidates will have to before Walk in Interview carefully reading the advertisement regarding the process of examinations and interview, eligibility criteria, Offline registration processes, payment of prescribed application fee/intimation charges, AIIMS, Jodhpur pattern of examination, AIIMS, Jodhpur Syllabus, AIIMS, Jodhpur Question Paper, AIIMS, Jodhpur Walk in Date, AIIMS, Jodhpur Result Date etc. 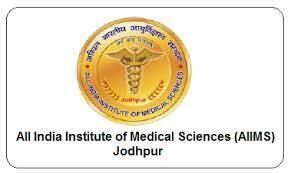 The fee shall be paid in the form of a Demand Draft/ Pay Order only, in favor of "AIIMS, Jodhpur" payable at Jodhpur. Candidate may deposit the requisite fee in cash at the time of interview.